Over 3000 students in the Houston Independent School District are homeless. This article recounts some of their stories and experiences. Learn how YOU can serve with CSM in NYC! A recent article shares about how some Harvard students are not only reaching out to the local homeless community, but also gaining valuable life lessons that aren't taught in the traditional classroom. Check it out! He Came from thr-ve on Vimeo. Recently, a CSM group leader posted this great blog post! We wanted to share it with you, too...enjoy! To really have an impact on some body’s life you need to have continued contact with them. Do you agree? Then why do missions differently? A mission team’s goal is to impact others lives by bringing the love of Christ to them. Why, then, do we not have continued contact after we return home? Our church needed something different. We needed to help our students focus on issues of compassion while able to respond with justice. Most of us are great at compassion; we are quick to meet an immediate or felt need.Not to diminish this, but often times it seems to be that our cultural response is no more then a band aid or quick fix. Then when it comes to justice or the root of the problem we have no idea what we are doing. So, this past summer we decided to partner with Center for Student Missions (CSM) for our summer mission trip. It turned out to be the best trip I have ever taken and my students have ever experienced. The main reason for our switch was not because other organizations are wrong or bad, but because CSM focuses on both compassion and justice. They helped our students work directly with programs and organizations that address immediate need, while helping people deal with the systemic issues of poverty, homelessness, broken families and so on. CSM is in the community the whole year rather than just during the summer months. This is that continued contact that changes people’s lives. In a sense they are really “Doing Life Together” like the ECC. On top of that, they are “not working for these organizations, but partnering with them”, like Covenant World Relief. The blessing of this trip was expanding our view of who God is; a more holistic view of missions; a new commitment by our students to be involved in working in our own community; and a revitalized commitment to relationships. Throughout the nation, street papers (newspapers made and sold by the homeless community) are selling great! While other mainstream newspapers are struggling big time, street papers are giving great opportunities to the local homeless community. Some individuals are even able to break out of homelessness thanks to the revenue they bring in monthly by selling street papers. It's a simple concept - a homeless individual can buy the papers for 25 cents each and sell them for a $1. With a growing demand for papers like this, that $1 easily adds up! Here's a great article from the Nashville Public Radio about the rise in popularity among street papers. When The Homeless Become Family with Brooke Sexton from The Work Of The People on Vimeo. Philly has the Christmas spirit! 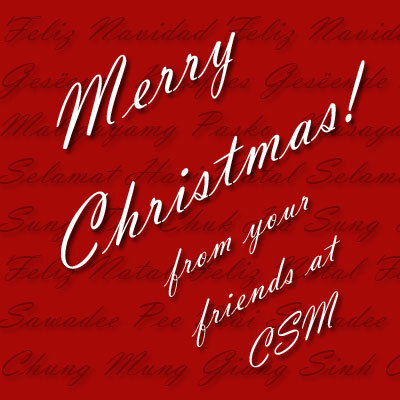 Christmas shop AND donate to CSM! That's right! You can be automatically donating to CSM while you're doing your Christmas shopping online through GoodShop - it's easy! Head on over to their website and enter "CSM" into the question "Who do you GoodShop for?". The FBI has been taking big strides to crack down on child trafficking throughout the United States. Many are still surprised to learn that modern-day slavery exists in this country, but it's absolutely in our backyard. Learn more about how YOU can serve with CSM in Oakland! Help Donate Socks with Hanes! Learn how YOU can serve with CSM in homeless shelters throughout the US and Canada! Anyone who's spent any time in the city has been confronted with this question. I've struggled for a while on how to respond to people on the streets asking me for money. It feels like either way, I don't feel quite right. When I give money, I wonder what the person will use it for (drugs, alcohol?). When I say no, I feel guilty for not doing anything. And when I just ignore them, I feel convicted of not even engaging the problem. Is this really how Jesus would treat this person? Is this how I would treat Jesus (Matthew 25)? Shouldn't love and compassion overrule suspicion and guilt? Arloa Sutter - a woman who is the executive director of Breakthrough Ministries in Chicago, and has years of experience actively engaging with those who are homeless - offers some great wisdom and insight into this issue in this article. Check it out and be encouraged! Many organizations are coming to realize that the old way of "handing out charity" isn't the way to go anymore. A recent Christianity Today article explores what it means to empower those on the receiving end and to give justly. Check it out!